A mighty performance’ (The Times). ‘A bold piece of soul-searching’ (The Stage). ‘Grips like a bear hug’ (ThreeWeeks.co.uk). 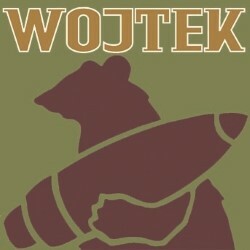 Theatre Objektiv’s award-winning, highly acclaimed show about the true-life Polish Soldier Bear who fought at Monte Cassino and who died in Edinburgh Zoo. Twice played Warsaw as well as touring Scotland (and London). Written by Raymond Raszkowski Ross; directed by Corinne Harris; starring James Sutherland & Gavin Paul with composer musician Sue Muir.